Minimize the guesswork regarding a vehicle's race performance with a portable PerformAIRE, the only patented weather station. PerformAIRE's V6.0 air-quality computer monitors temperature, relative humidity, barometric pressure, and the amount of oxygen in the atmosphere through state-of-the-art sensors*. Then the information is sent to a microprocessor where density altitude, oxygen altitude, and projected values are calculated using equations formulated specifically for internal combustion engines. 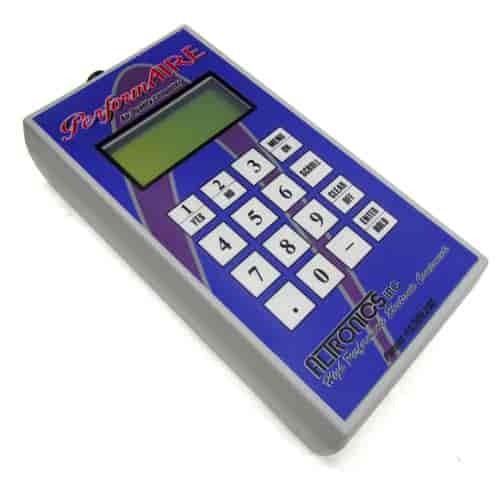 The PerformAIRE computer has an expandable database to store vehicle runs and use the results to predict elapsed times, throttle stop settings, jet sizes, etc. Projected values are continually updated with each new air sample (density altitude and oxygen altitude are saved with each run when an O2 sensor has been installed). Stored runs are date/time stamped for later reference, and hundreds of runs can be labeled individually for particular vehicles or tracks. Database details can be downloaded to a personal computer as a spreadsheet that automatically charts vehicle performance vs. the changing atmosphere. This allows bad runs to be deleted from the database to deliver more accurate predictions. PerformAIRE is superior to other weather stations/calculators because of its ability to accurately and repeatedly measure current race conditions. Detecting minor atmospheric fluctuations can be the difference between losing and winning. On average, a 1° change in temperature, 0.1 in/Hg change in pressure, 10% change in humidity, or 0.1% change in oxygen can equal more than a 100' change in altitude. Variations in temperature, pressure, humidity, and oxygen level do not equate linearly with altitude, so consistently wrong readings should not be considered dependable for generating correct outcomes (e.g. a gauge that always displays 5° higher than the actual temperature cannot provide a valid prediction).The PerformAIRE air quality computer's state of the art sensors allow it to measure density altitude with an accuracy of better than plus or minus 50 feet over the entire temperature range and with even closer repeatability. No other weather station, digital or mechanical, can claim this degree of accuracy. Not even other all in one digital weather station has this degree of accuracy!